Between renunciation of relative world illusions and nirvana (c.f., heaven), lies the swamp of disillusion. It is a bardo - a state between the life you left behind and the life that lies ahead. It is unknown to you when or where you will emerge, so be patient. You may be in this for awhile. You've kissed the void and thrashed around in it for awhile. You've screwed apparent reality, but you've set aside concern and set out upon the barren landscape left in the wreckage. You're not the numbed-out, dumbed-down person who stepped onto this path not so long ago. There is no desire to go back and you are drawn further down the path. You'll try to convince yourself that this is better than living within delusion but, down deep, you'll question your sanity if you start to believe it and even doubt your integrity if you affirm such a belief to others. You'll likely be thinking that you're nearing the end of this arduous journey and beginning to think about where you will plant your flag. Instead, you find yourself standing now before another crossing. The decimated scene is illuminated through the haze by a source in the distance. There is starkness, disorder and disorientation. Seepage from below the boundary of consciousness makes its way to pollute the surface. A swamp forms around you flooding the barren, sandy landscape. It's a heartbreaking realization - a naked surprise. You're not yet out of the illusion. This swamp is its underbelly bubbling up from the dark, vast reservoir of the subconscious like oil seeping from a run-aground freighter. The illusion you tamed in consciousness was apparent if not self-evident. This one was rarely seen. You notice this now as it rises before you in a silhouette of shadowy figures. The swamp stretches out over the path ahead in way of the other shore and blocks your return to the world you thought you knew. The distant shore you seek is still not within view and there is little here to support you. 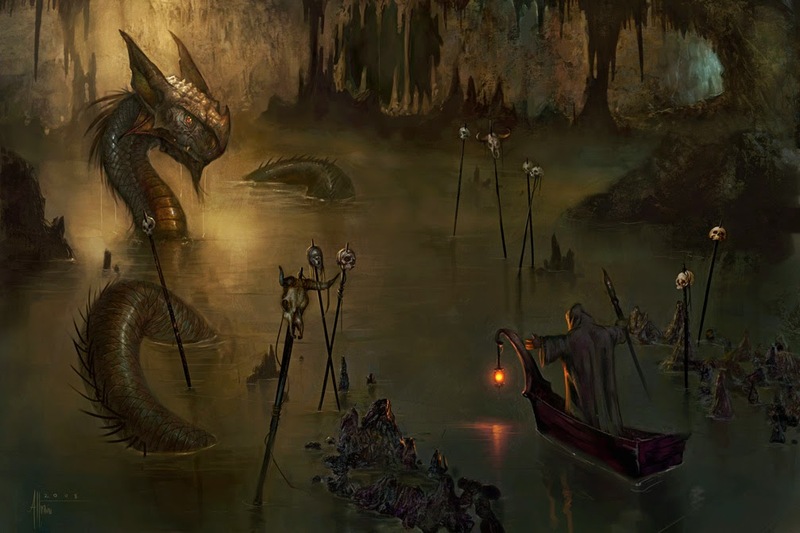 Swamps are treacherous, shadowy, dank and stark - inhabited by familiar creatures you begin to recognize for the first time. This realm of the disillusioned is littered with the corpses of those who have gone before you and soulless beings of the undead. It's imperative to keep your spirits up. Depression is not forgiven here though you may feel entitled to it. You'll get angry and frustrated, but serpents in the swamp will feast on your rage. Use this time to heal your passion as, more than anything else, it will mire you in the muck and prevent you from reaching the other shore. You'll be afraid, but the swamp monsters will sense your fear, hunt you down and devour you if it isn't managed. Avoid impulses to attempt an escape - losing yourself in this environment is most often fatal. This is the place to surrender. You can't fight the monsters - you'll just be fighting yourself. Slow down, you can't push through this. Attempting to rip through it will entangle you in the weeds. You'll spend allot of energy to free yourself and you'll then likely just push ahead and get entangled again. Allow the slow currents to carry you, making only minor adjustments to a course that seems preset. The destination is unknown to you, so why insist on charting the course? Here you'll realize that the other was only part of the problem. In this new light is revealed this swamp on the other side of appearances that you have carried. The shadows have been there all along and seen by others, but you have glossed them over into the background colors of your fabricated world. Here they are, blocking the path to the other shore. Conquer them here with the light of your unconditioned awareness. There's nothing behind you and there's nowhere to go. There remains much be learned. Look around; find your curiosity; get interested in what appears. The way to the other shore will reveal itself when you are ready to travel it. Then, you will cross over and this will be the last time you will ever have to see this place.